It can be difficult to admit that you are losing your hair, but the truth is that the sooner you start doing something about it, the faster you will start feeling like yourself again. 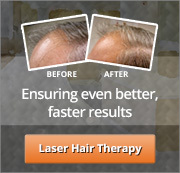 Our Greater Boston hair loss clinics treat each client as an individual. The underlying causes and signs of male pattern baldness are different for each person. There is no one-size-fits-all solution. Unfortunately, many have tried over-the-counter remedies based on positive reviews from family and friends, yet did not experience the same results. Don’t give up hope. South Coast Hair Options provides comprehensive treatment solutions in Southeastern Massachusetts for hair loss in men. Our many years of experience have helped us to offer services and strategies not available through other hair loss clinics. From our South Coast laser hair therapy for hair loss to other pain-free, non-surgical solutions, you can get that full head of hair that you know you deserve within just a few visits. While there are lots of different reasons why you might be losing your hair, the most common by far is something known as male pattern baldness or androgenetic alopecia. While hair loss does not happen overnight, it can start earlier than most men realize. Many men begin losing their hair in their 20s and can have a complete pattern of hair loss by the time they are in their 30s. Hair loss is not something that is saved for men in their 50s, 60s, or 70s. It can strike young men when they least expect it. Consider coming into our Greater Boston hair loss clinics in New Bedford, MA to get a FREE consultation. We can help you identify whether the signs of male pattern baldness that you are seeing are legit or paranoia. It is not uncommon for men to assume that they are losing their hair because they are worried about it. Just because your father or grandfather had a receding hairline, does not mean that you will too. However, if you are experiencing hair loss or thinning hair to some degree, we can recommend treatment. Our Corrective Hair Solutions (CHS) approach includes a variety of treatment options, including South Coast laser therapy for hair and Virtual Reality for Men. We begin each client relationship by performing a FREE scalp evaluation. This helps us to identify the underlying cause of hair loss and help you understand the significance of your signs of male pattern baldness. 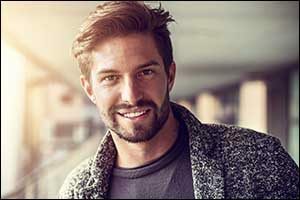 Southeastern Massachusetts hair loss in men is more common than you think, but it does not have to be a life sentence. We have a variety of treatment options and solutions available and can create a custom approach designed just for you and your unique condition. Our CHS program is safe, natural, affordable, and won’t restrict your active lifestyle. Each treatment is individualized to your needs to work with your existing hair and solve ALL of your hair loss problems. If you have noticed signs of male pattern baldness or thinning hair and want to do something about it, contact our team of highly trained and experienced technicians to set up an appointment. Our Greater Boston hair loss clinics have earned a solid reputation in the South Coast region for providing top quality treatment options and natural results. Give us a call at 508-995-7085 to schedule an appointment or to speak with a representative about the services available at our New Bedford clinic.